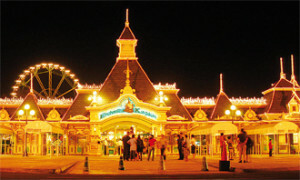 Take your kids to Enchanted Kingdom and experience fantasy, adventure and thrilling rides! The theme park is Philippine’s best. It is a 17- hectare, 1.2 billion-peso theme park located in Santa Rosa City of Laguna which is about 18 miles or 29 kilometers from Manila. EK is located in Sta. Rosa, Laguna. It was designed based on Knott’s Berry Farm and opened in 1995. A regular day pass ticket will cost you 600 pesos on weekends and 500 pesos on weekdays. Enchanted Kingdom is a member of the International Association of Amusement Parks and Attractions (IAAPA). One notable area of amusement park is the Victoria Park; its structures are inspired by the era of Queen Victoria’s rule. One of the entertainers of Victoria Park is Eldar who is also known as the mascot of EK. Portabello is also one of the main attractions of the theme park as well as the Rio Grande boat ride which is considered as the largest attraction found in the park. Portabello also includes the Flying Fiesta which is a giant swing ride, Xtreme Paintball, 4D Discovery Theater, and the Portabello Show. The Boulderville section is a prehistoric inspired area with dinosaurs as main characters. Most rides are designed for children and these rides are named Petreefied House and Rock Quarry. The area also showcases puppet shows and dinosaur mascots. The Midway Boardwalk section is a colorful and enjoyable zone inspired by Coney island popularly known as”America’s Playground”. Mimes, clowns and jugglers inhabit the carefree area. Brooklyn place is a theater and shopping zone while Spaceport is inspired by NASA space programs. Jungle outpost offers jungle adventure. Merchandise within the theme park are Discovery Photo, EK Cafe, Treasure Island Gift and Rio Grande Photo, Stir Fried Rice and Purefoods TJ Hotdog Kiosk, Henna Tattoo and face painting, Feltman’s, Soda Fountain, Rialto or the Simulator Ride, Broadway and Brooklyn shows, Parade at the cobblestone street. Your family getaway will never be complete without spending an entire day in Philippine’s popular theme park, the Enchanted Kingdom. When you want your kids to truly enjoy their Philippine vacation, put EK among your family holiday destinations!